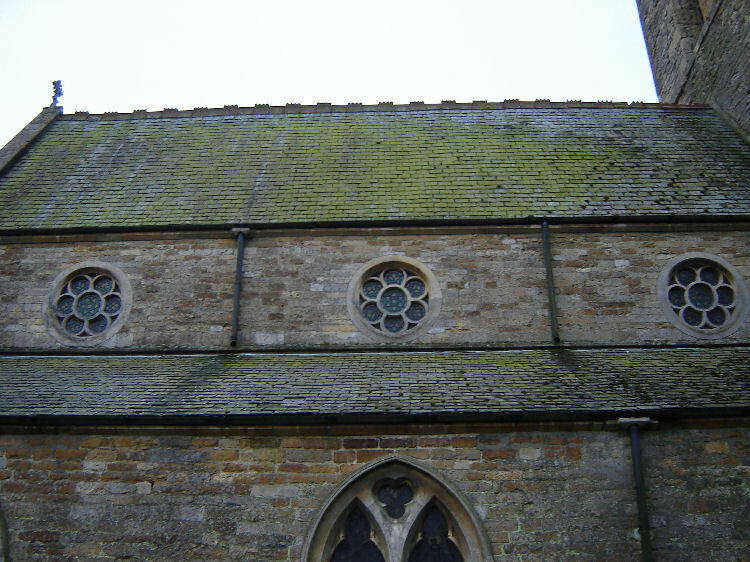 I have looked at many churches on this journey and I am yet to see one displaying the 6 seals that can be seen so predominantly on All Saints Church at Harmston…3 on the North side and 3 on the South, running the length of the main body of the church and placed in the upper roof section. These 6 seals show an inner circle divided into 4….and an outer circle divided into twelve. 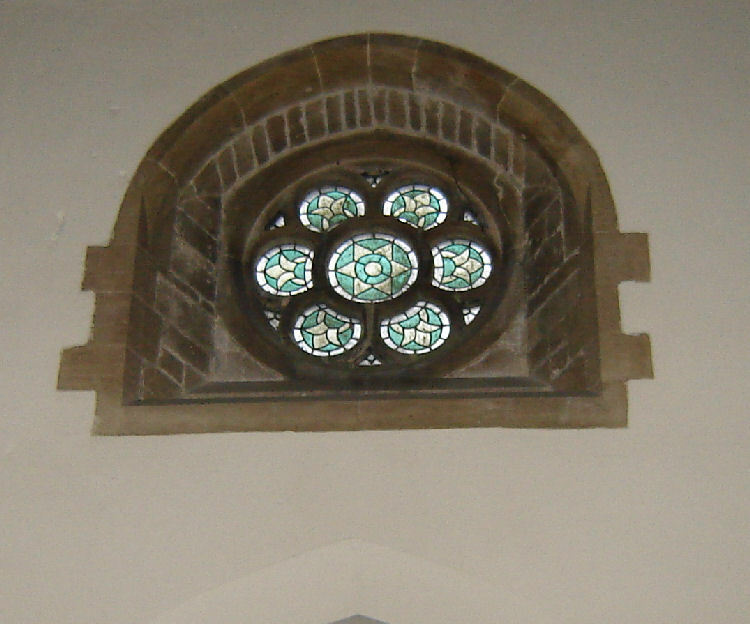 The six windows show various combinations of the 3 features..the star, the quartered circle and the outer ring of twelve points. 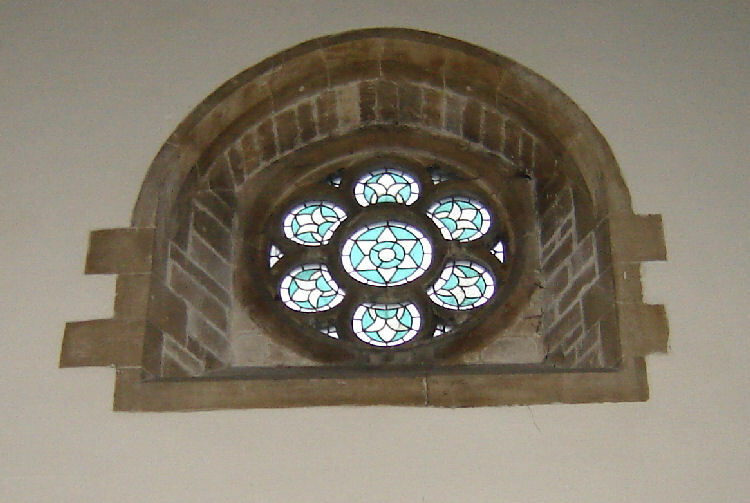 The geometry of Temple Bruer shows the same basic geometric pattern, a six pointed star and is also situated at the bottom leg of the larger penta…with a main penta line connecting Temple Bruer church back to Harmston Church. 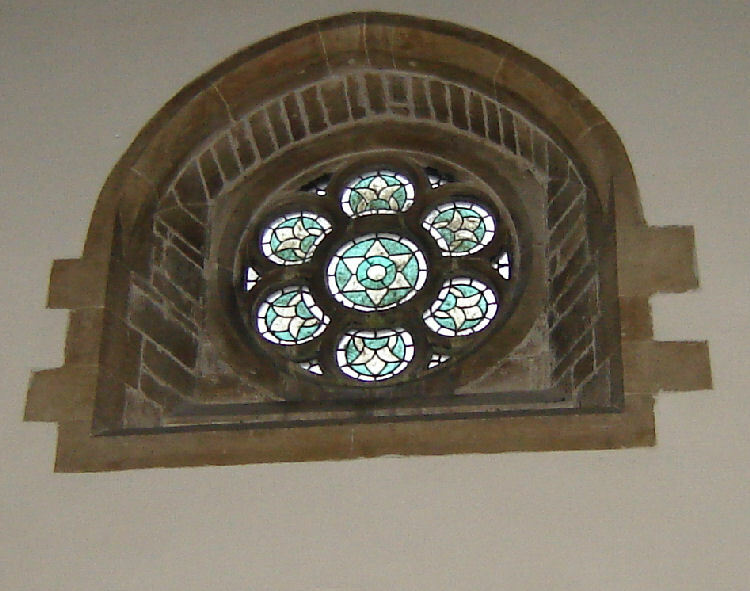 The solstice alignment through Bruer is even depicted in one of the ‘seal windows’ . 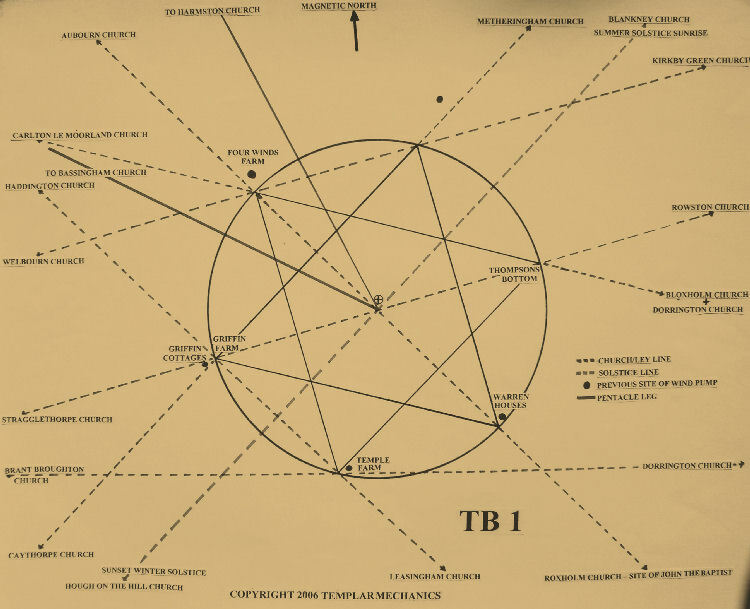 The small inner circle line cutting through the point of the intersection of the two triangles and is a good depiction of the TB1 solstice alignment. The other alignments noted in the windows by the inner circle and the outer 12 points may relate to other times of the year, this will be looked into in due course. 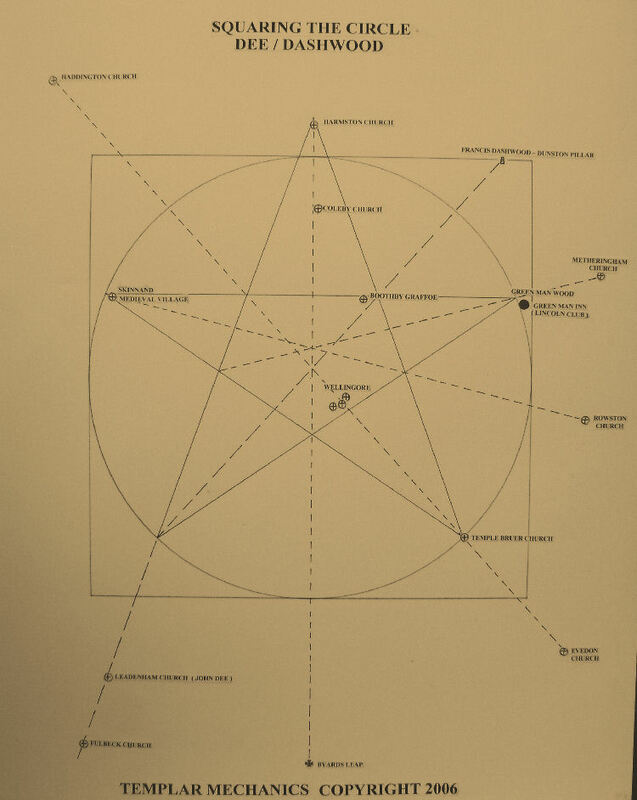 Harmston church has some interesting links to other points in the Bruer geometry. While working on Francis Dashwood’s Dunston pillar, a workman… John Wilson, fell from the top to his death. The original top lantern had corroded away and in its place a coad stone statue of King George III was being put in its place. John Wilson was buried at Harmston church .His grave has the following inscription. The stone is dated September the 9th……this then appears as …………..9/9. 1810 Numerologists can have a field day at Harmston ….….here’s a few more synchronistic examples. 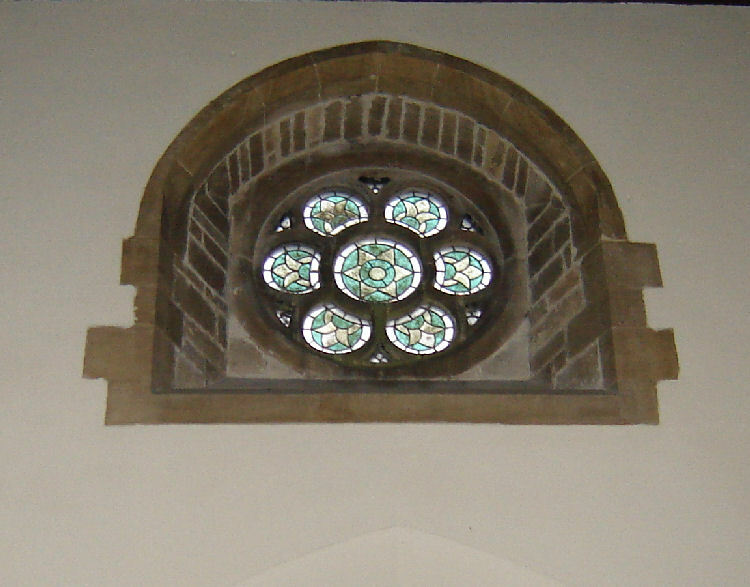 as the year that Thorold Repaired church and chancel. To be made Lord Mayor of London would suggest a person of power and influence …it is then fitting that the family church is situated at the top of the Penta. 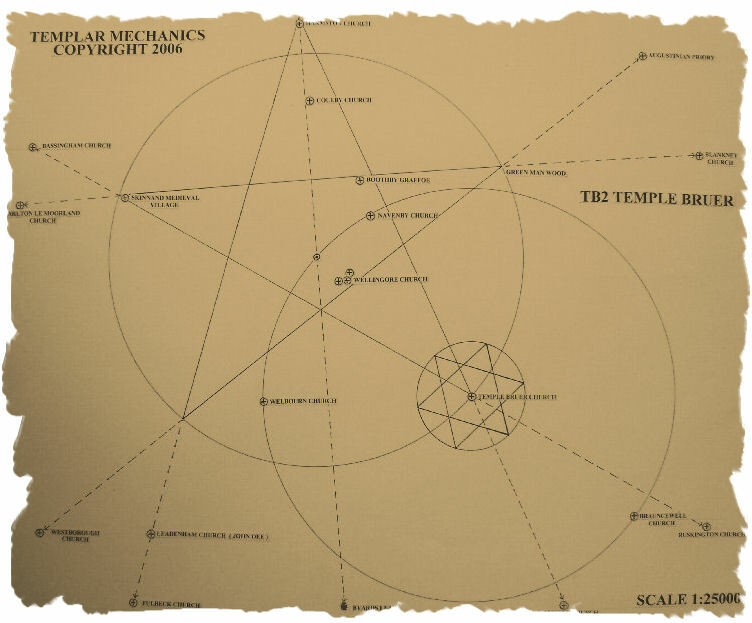 It has to be said there are some very influential people interacting at different points of the Temple Bruer Geometry. George Thorold…….…Knighted 1708 , Baronet 1709 and elected Sheriff of London, Lord Mayor of London1722. Incredible for an area in the middle of nowhere approximately 6 miles square. Makes one wonder whether the people taking up residence in the area were aware of the power held within the dynamics of the landscape, and in particular points of significance where the churches of Temple Bruer, Leadenham, Blankney And Harmston are located…..as well as the uncanny Positioning of Dashwoods ‘Dunston Pillar’ and its relationship to the main penta . 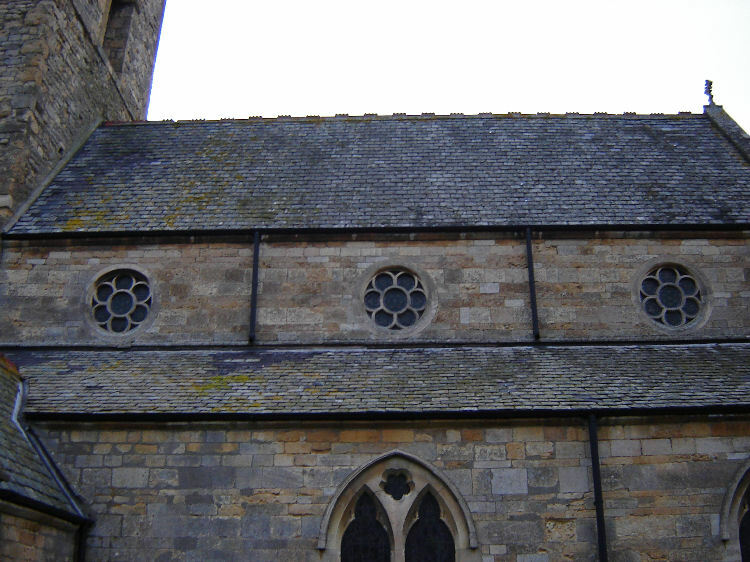 Bisham Abbey ( Knights Templar) in Berkshire in a strange twist is also connected to Harmston via St Katherines priory in Lincoln. This I discovered while reading the Harmston Church information booklet by Jennifer Playford BA, which is available inside Harmston church for the sum of £2. Here’s a small excerpt from the booklet relating to Bisham Abbey, the old Knights Templar haunt . 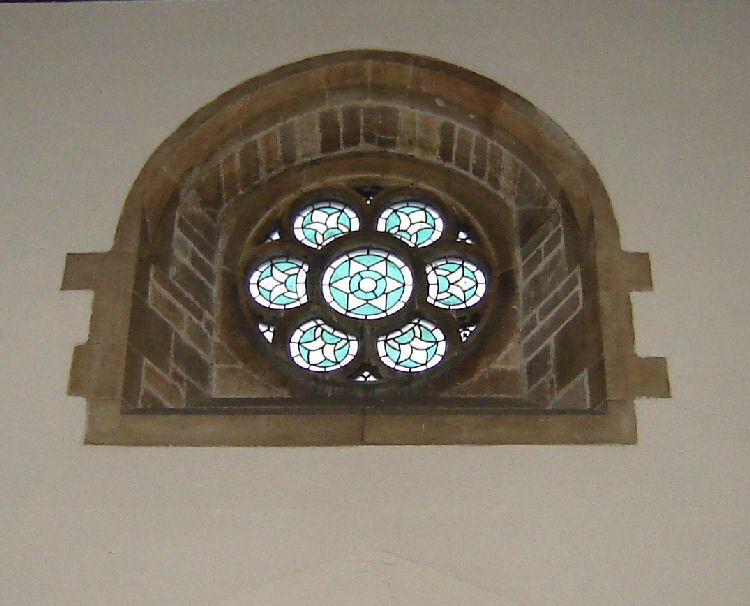 ‘In the middle ages the revenues of churches were sometimes given to monasteries and nunneries with the right to present to the Bishop who should be the parson and serve the church. When these monasteries came to an end in Henry VIII’s time, their property was often taken over by the crown and later sold to laymen who, as regards their rights in the church , were called lay rectors. 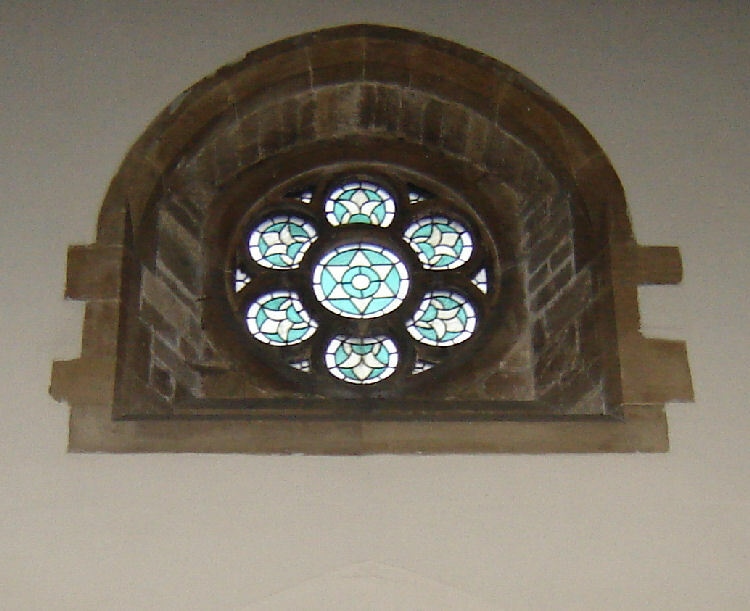 In 1374 William de Monteacuto, Earl of Salisbury obtained the kings licence to give the advowson i.e The right of presentation to benefice and an annual rent of 7s. to the prior and Convent of Bustlesham (Bisham) Priory in Berkshire and the prior of that place used to nominate the parson to the Bishop. Perhaps this seemed inconvenient at such a distance or perhaps Bustlesham ( Bisham ) priory was hard up and needed ready money but it sold its rights to St Katherines Priory, Lincoln, Which gives its name to a district in Lincoln to this day, and the prior there nominated Harmston’s vicar from then onwards till the reformation and the end of the monastery. Bisham Abbey ( Knights Templar) is near to Medmenham Abbey….in fact it is the 5.15 mile circle radius...see Bisham Abbey graphic off the Knights Templar tab. Members of the Hell fire club would meet Francis Dashwood at Medmenham Abbey . The Hell fire club offshoot …’The Lincoln club’ would meet at the Green Man Inn at the East arm of the penta within another 5.15 mile geometric system, around another Knights Templar site. 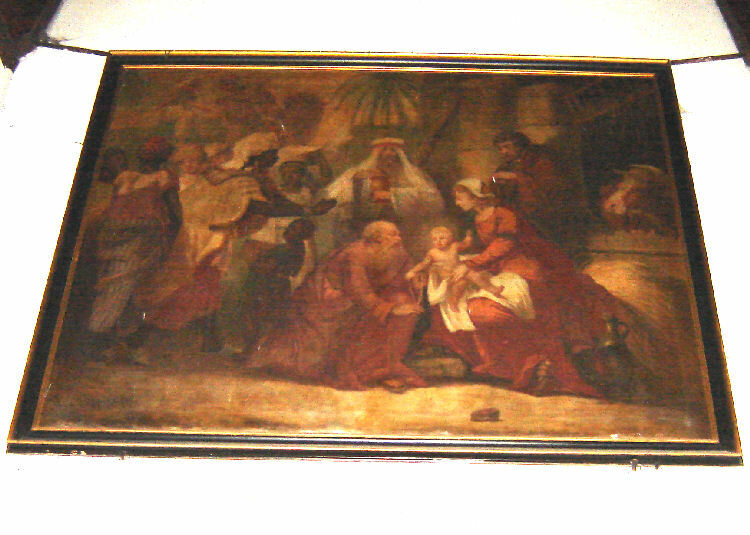 Below is an interesting picture from inside Harmston Church.